From right to left: UNIFIL Director of Mission Support Mr.Wolfgang Weiszegger, UNIFIL Head of Mission and Force Commander Major-General Luciano Portolano, LAF South Litany Sector Commander Brigadier-General Charbel Abou Khalil and LAF Intelligence Chief (Southern region) Brigadier-General Khodor Hammoud. UNIFIL Head of Mission and Force Commander Major-General Luciano Portolano with LAF’s Brigadier-General Anton Mourad and Brigadier-General Hassan Bacharoouch at Blue Line marking in the vicinity of Kafar kela. 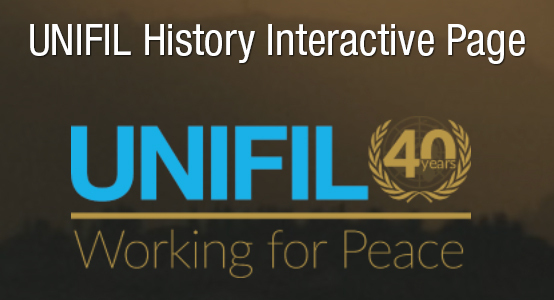 UNIFIL celebrates the 70th anniversary of the founding of the United Nations. Lebanese singer Ahmad Kaabour performing at UN 70th Anniversary in Tyr. UNIFIL Guard of Honor marching during the ceremony to commemorate International Day of Peace held at UNIFIL Headquarters in Naqoura.